When you’re focused on food costs, the price of water seems nominal. At less than a penny per gallon, you may throw caution to the wind and let the taps flow. But step back for a moment and do the math: A thousand gallons of water cost about $1.50, which doesn’t seem like much until you realize, the average commercial kitchen uses over two-million gallons of water per year, with many going well above that mark. You’re spending several thousand dollars per year, just on water. If you’re wondering how to reduce expenses in a restaurant, that’s money you could definitely direct elsewhere! The reality is: restaurants require a lot of water. In fact, restaurants and hospitality account for 15% of the total commercial water use in the US! Food preparation, cleaning, sanitation—it always requires plenty of good ol’ H2O. Water runs freely and liberally in most restaurants. After all, what restaurant owner is going to get nit picky about a dripping tap? You can’t make food without water. But when it comes down to it, managing restaurant costs is vital for staying afloat. You can’t afford to waste a penny or a drop. The restaurant industry is cutthroat and keeping your restaurant in the black is a constant struggle. Here’s how to keep your head “above water” by reducing water costs in your restaurant. These little tips and tricks are easy enough and won’t frustrate your staff or shortchange your customers. With a few steps towards efficiency you will see a noticeable reduction in your water bill. The most obvious way to cut water costs is to simply become more cognizant of your usage. Water-consuming equipment may remain on for convenience but ends up sending dollars literally down the drain. Equipment like dipper wells and even your ice maker can be adjusted to use less water or to avoid a constantly running flow. Turn down those water stream valves as well. Encourage staff to be mindful of water usage, turning off the faucets and machines when not in use. Staff should presoak dishes and load the dishwasher as efficiently as possible. In your bar, don’t rely on running water to melt ice in the sink trainers. Turn off the continuous stream running to drain trays of your beverage dispensers. Consider installing automatic sinks and shut-offs or foot triggers on your faucets. Wondering how to tell if you’ve got leaks? Turn off your faucets and water everywhere in the restaurant. Check your water meter, wait two hours and then check your water meter again. If you see steady forward movement, in may indicate a leak. Don’t kid yourself about how much water is wasted by a leaky water line or faucet. 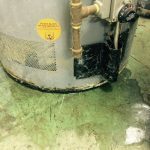 The cost of repair is much cheaper than ignoring this problem for any length of time. Check for obvious drips and keep and eye on the pavement around your building as well as piping around your appliances for puddles. Don’t forget to check your bathroom as well. A large leak can lose a staggering 4,000 gallons of water per day! A basic food safety protocol is to never defrost food in warm water. To properly thaw food, cold, flowing water must be used. While it’s sometimes necessary to quick-thaw foods during a busy night, work hard to plan ahead. A less wasteful method is to simply defrost food in the fridge well-before it’s needed. If your excess greywater is free of salt, reuse it to cut back on irrigation and landscaping costs. Consider collecting water in an overflow container and using it outside. Proper dishwashing techniques are an important part of water conservation. Increase the efficiency of your commercial dishwasher by only washing fully loaded dish racks. Teach employees how to properly load the dishwasher and encourage them to pre-soak dish loads before washing. Streamline your dishwashing process and save! ENERGY STAR® equipment saves more than just energy. Many ENERGY STAR® certified appliances also save on water consumption. Most commercial equipment comes in an ENERGY STAR® certified model, so consider swapping out your older pieces for models to save you in the long run. ENERGY STAR® quality rated refrigerators, ice machines, dishwashers, beverage dispenses, freezers and other machines that have water lines connected directly to them will lower your water costs over time. You can also install air-cooled ice machines (no water needed to cool the condenser) and energy efficient lower-flow spray heads as ways to reduce water usage. Another option is to blast your dishes with 180°F hot water by using a high-temp dishwasher backed with a booster heater to ensure your dishes only require one wash. If you’re considering replacing your dishwasher, a high-temp warewasher may be a better way to go. Bonus: High-temp warewashers also use less overall water per wash cycle! Food steamers that are boiler-based, use up to 40 gallons of water per hour. Similarly, boiler-based steam kettles use a central boiler that requires regular flushing of the supply lines. Wok cooking and cleaning also uses up to 800 gallons of water per day due to a continuous flow. Retrofitting a boiler-based steam cooker to use a condensate return system will cut back on water use. You may also consider using a self-contained/closed-system steam cooker, and a recirculating wok, which reuses the water supply and condensation. ENERGY STAR ® steam cookers use less water and create less waste as well. If you’re considering an upgrade to your cooking equipment, water-efficiency is an important consideration. Many people forego ordering water altogether in favor of other beverages, and oftentimes water glasses remain on the table virtually untouched (yet, still destined for the dishwasher). The simple act of providing water upon request cuts waste in a small way, without diminishing the great experience for your restaurant patrons. Watch your restrooms as well. Leaky toilets or dripping faucets are a huge source of water waste and restrooms are an area often overlooked in restaurant water waste. Consider replacing toilets and urinals with low-volume models. Installing automatic sensor faucets are another option to cut back on water waste from guests. It can’t be overstated how closely related water usage is linked to saving (or not saving) money. By adopting effective ways to reduce water usage, you’ll impact your bottom line. With little effort, and some simple tips, your money won’t be going down the drain. That’s something to make any restaurant owner smile. Featured Image courtesy Flickr user raysawhill. “Water” courtesy of Flickr user Vassilis. All images licensed for use under the Creative Commons.